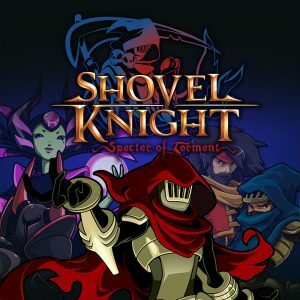 Shovel Knight: Specter of Torment is the newest addition to the ever so popular Indie classic known as „Shovel Knight: Tresure Trove“, by Yacht Club Games. It‘s both a free addition to those having owned the original game as well as a stand-alone purchase for all others. It features action-packed Jump‘n‘Run gameplay, being an hommage to the 8-bit NES classics, most notably Mega Man. 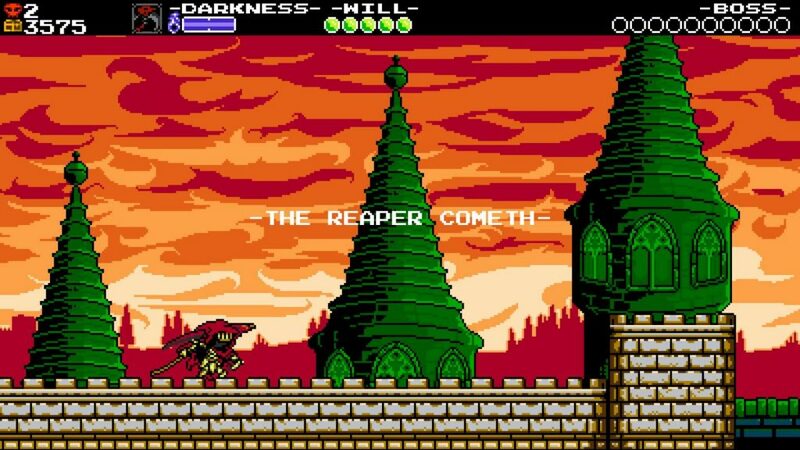 However, this time the game‘s protagonist is Specter Knight, one of the adversaries of the base campaign. If you played the original, you will immediately recognize this DLC‘s gameplay. In fact, some of the mechanics are still the same, such as the standard slash and the style of level design. 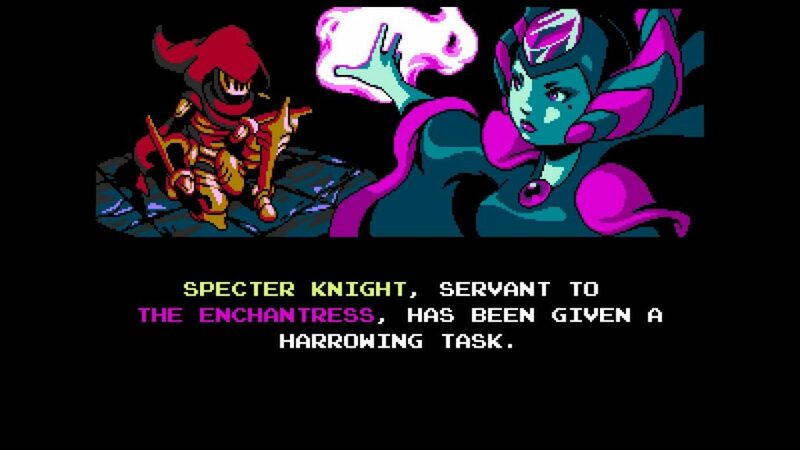 However, Specter Knight still has unique traits and abilities to make him stand out. 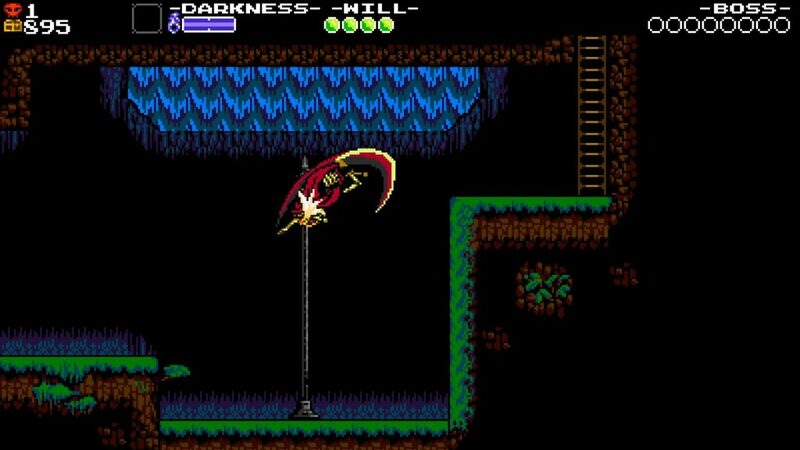 First of all, in contrary to Shovel Knight, he is unable to hold his Scythe downward to strike onto enemies from above. Instead, Specter Knight can dash at a nearby opponent while he‘s airborne and reap through them at one of two given angles, downwards and upwards. Additionally to that, he can climb small segments of some walls, and wall-jump from them. The combination of these two new abilities make for a much more mobile playstyle than the previous two campaigns. For example, an opponent might be too tall to just jump over and is invincible except for its head. In this case, the knight could jump on the wall behind him, climb up a portion, jump off it and upward-strike at said weak spot, getting out of danger while also dealing damage. At another time, he might use several flying adversaries as jump-ramps to reach the opposite end of an otherwise too wide gap. With just two additions to the ability roster, the player now has to take different approaches to an otherwise familiar level layout, which allows for refreshing gameplay. 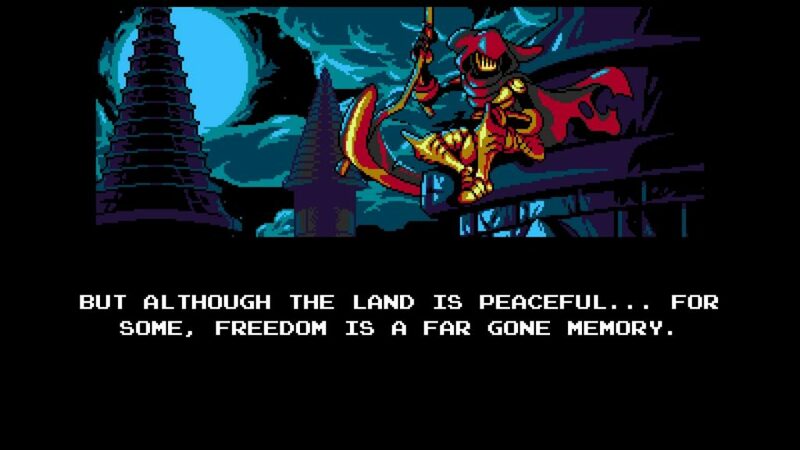 …through which Specter Knight can slash, crossing the distance. Even more adding to this is the high variety of challenges within the level, as was also the case for the original. Every level has its unique enemies and obstacles, which are usually introduced in a short and simple tutorial passage and then further explored during the level. This makes the learning experience a fluid one as the challenge level constantly rises. An easy introduction is definitely needed, because the levels can pose quite a challenge. This is especially true if you want to find all the hidden collectibles, which are partially hidden in bonus rooms. Due to falling pits and spikes being instantly lethal, good timing and quick thinking is required as well as good use of your items. The Dread Talon is just one of several curios obtainable throughout the game. Speaking of items, the arsenal of which, initially called „Relics“, has been replaced by the similarly functioning „Curios“. Instead of Magic, Darkness is now required to use them, which refills upon defeating enemies and damaging bosses. Though the concept might be similar, the effects of the new items are mostly new and thematically appropiate for an undead. 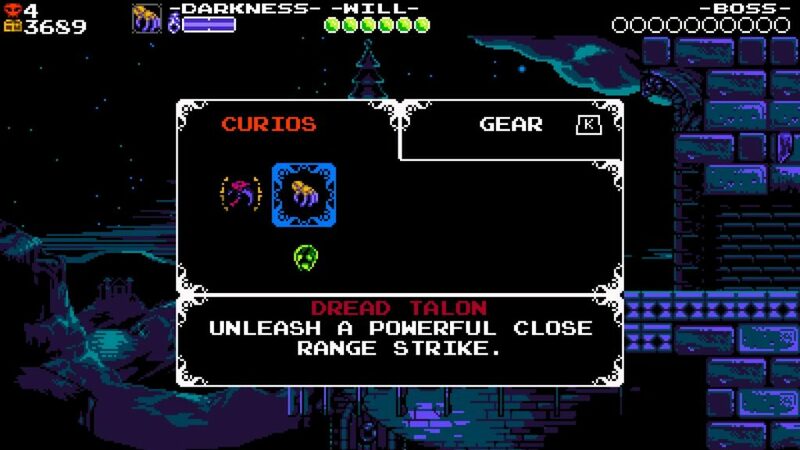 For example, the Curios that restores Specter Knight‘s will, his equivalent to health, is a skull imbued by dark magic. Another example would be his throwing weapon, the Boomerang Scythe which returns after a medium flight distance traveled. We find the additions of the new items to be well thought and polished, as they add quite a bit more options. 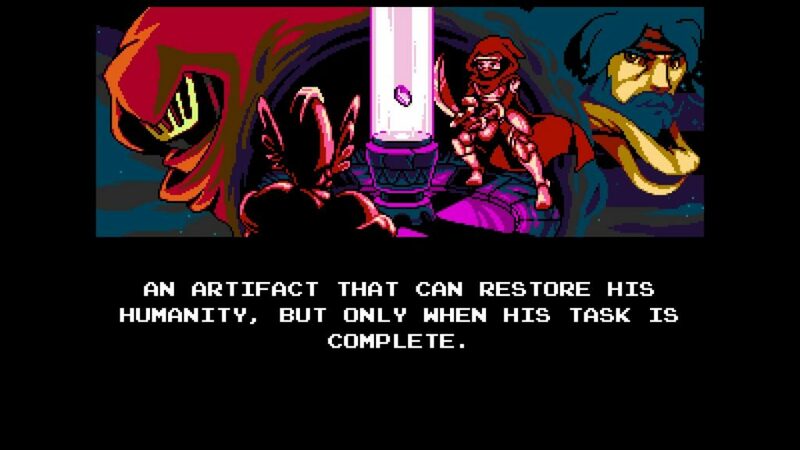 Keeping the same format of the base game, Specter of Torment presents its storyline in an initial sequence of 8-bit pictures alongside some explanative text. Within about 2 minutes, the game sums up to the player exactly what his ultimate goal is: find and recruit all the Knights that should later become the Enchantress‘ „Order of No Quarter“. If he manages to accomplish this task, he is promised to gain access to the full powers of the Heart Locket, an artifact supposed to allow any Undead to return to life. After the brief opening, the player is thrown right into the fray, immediately heading out to recruit the first member and entering the first level to explore. After this brief introduction, the player is thrown right into their first mission. While the story is rather brief and straightforward, it avoids being shallow by keeping the players on their toes. 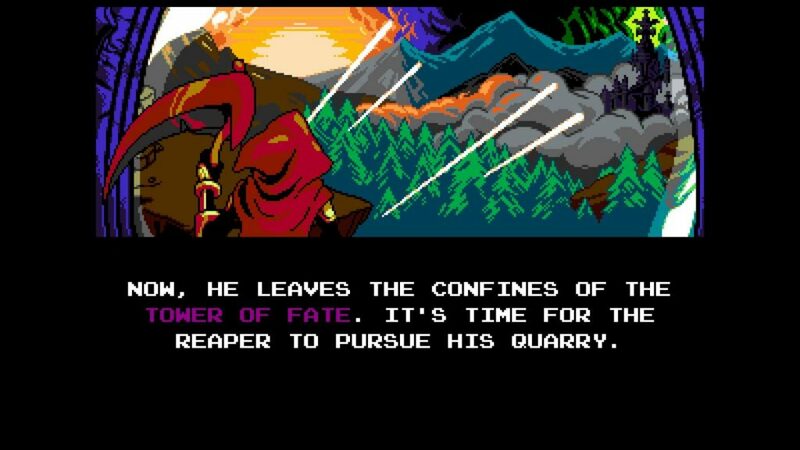 Every now and then after completing a level, another episode of Specter Knight‘s past is revealed in the form of a playable retro episode. 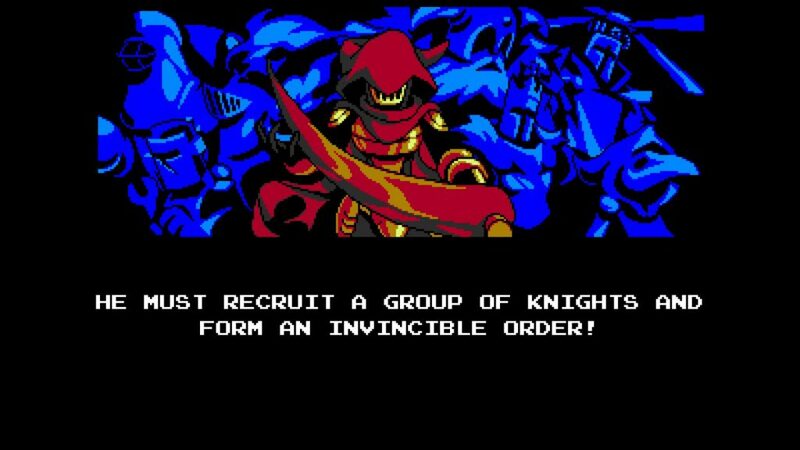 Unveiling Specter Knight‘s backstory little by little felt rewarding and motivated us further to play the levels. It certainly added to the general immersiveness of the world by letting the player see it from a different perspective. What should also be mentioned is that there‘s a generally darker and more grim aspect to both the storyline and atmosphere, capturing the spirit of a grim reaper. It‘s explicitly said by Yacht Club Games that their third try on a campaign should carry a tragic, melancholic atmosphere. The typical humor and quirk of the original are still there to some degree, as there are still plenty of those mostly in character dialogue and design. All in all, we find that the melancholic touch has been executed very well and fits the theme of a grim reaper. As with the graphics style, the soundtrack is also clearly heavily inspired by the original classics, being composed in 8-bit, meaning it would technically be playable on a NES. Despite that, the composer of the tracks, Jake Kaufman, succeeded in making them distinct enough to their role models, establishing his own style. It‘s also notable that Manami Matsumae, the creator of the original “Mega Man” soundtrack, directly helped him with some of the tracks for the first Shovel Knight. In Specter of Torment, a whole new soundtrack has been composed to accompany the knight on his quest. Like the storyline, this one has also been altered to fit the darker and more melancholic theme of the game. Some of the tracks are loosely based on the base game‘s in the same location; other tracks are also remixes(such as „The Lonely Parapet“ is to „Fighting With All of Our Might“), but most of them are completely new. Even with the occasionally darker touch, Specter of Torment‘s arrangements are equally as catchy and invigorating as the original‘s. For us, it was the music that kept us going after failing the same passage of a level for the tenth time. True to its promises, Shovel Knight: Specter of Torment strives to deliver a Jump‘n‘Run experience that truly lives up to the base game. While keeping the core elements intact, some simple, but meaningful changes to gameplay and atmosphere allow it to stand off at its own entity. Be aware though that the game is a challenging but fair experience. If you are looking for something easy going and relaxing, you might want to look into other games instead. It‘s very likely that if you‘ve enjoyed the base game, this addition will also meet your expectations. Calling it a game mode would imply that it‘s a subpart to the main game, when it‘s actually on equal terms with it. While it does recycle the names and tilesets of the original levels, they have been altered to suit the new playstyle and new elements have been added, mitigating that lack of innovation. As for value, consider that the play time of this campaign is rather low, ranging from on average four and a half hours for just the main story to around six for the 100%. However, there is also a New Game Plus, which is even harder to beat, as well as several stand-alone challenges accessible from the main menu. Because of that and the high replayability and quality the game offers, we deem Specter of Torment worthy of its full MRSP of $9.99. 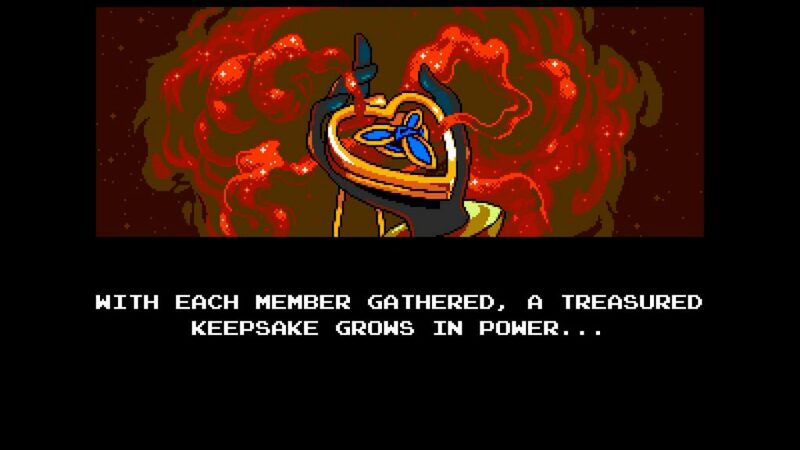 All in all, we find Specter of Torment to be a more than worthy addition to the Treasure Trove. It lives to be a role model to what DLCs should optimally look like, delivering sufficient new content and a fresh experience instead of held-back segments of the game. Because of that, we are willing to give it a score of 86. A lot of the points made in this review also apply to the other two campaigns, since they are indeed similar in style. We might also review „Treasure Trove“ as a whole as well at some point. Since we have already played it in the past, we can definitely say that Shovel Knight: Treasure Trove would get its full value of $24.99 from us. If you are already quite certain that this game would be for you, you might as well just get the whole package. 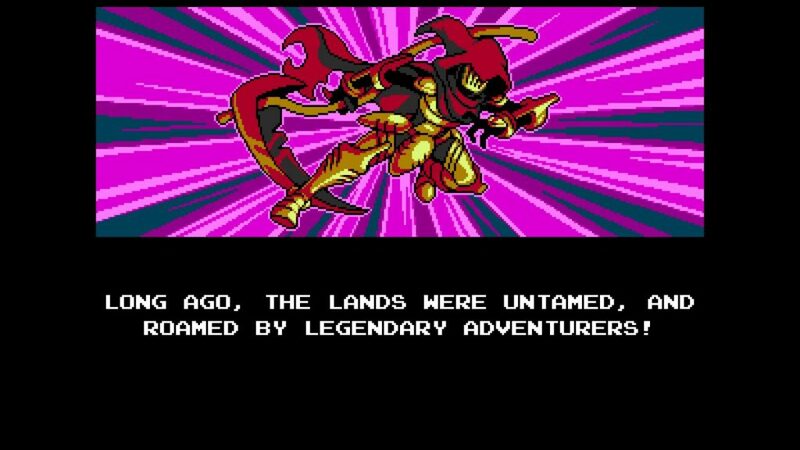 True to its promises, Shovel Knight: Specter of Torment strives to deliver a Jump‘n‘Run experience that truly lives up to the base game. While keeping the core elements intact, some simple, but meaningful changes to gameplay and atmosphere allow it to stand off at its own entity.